There is No UN backing there is No Westminster backing there is No transparency and there is No process. The strikes on Syria have little to do with seeking peace and everything to do with covering the domestic shambles of Trump and May, the Prime Minister’s Brexit embarrassment and the President’s unfolding legal humiliation. Theresa May has usurped the UK parliament and Britain’s vague quivering set of constitutional ambiguity is once again used as cover for direct rule. It’s not exactly a revelation but Comey’s declarations are still astonishing. “The central themes that Comey returns to throughout this impassioned book are the toxic consequences of lying, and the corrosive effects of choosing loyalty to an individual over truth and the rule of law. Dishonesty, he writes, was central “to the entire enterprise of organized crime on both sides of the Atlantic”, and so, too, were bullying, peer pressure and groupthink – repellent traits shared by Trump and company, he suggests, and now infecting our culture. Kakutani has a ruthless eye for detail, noticing for instance that he’s never seen Trump laugh, an inability to “be vulnerable or to risk himself by appreciating the humor of others, which, on reflection, is really very sad in a leader, and a little scary in a president”. 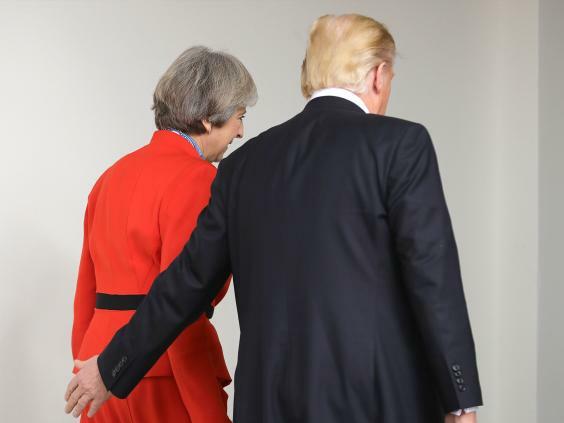 If Trump is forensically described as a quasi-Mafioso lying narcissist, his Special Relationship with Theresa May makes her, a weak and precarious Prime Minister, look weaker than ever. Like many weak leaders she has turned to the military in time of need, but all the indications are it will give her less not more security. She has little public support for her actions which she has gone ahead with without the backing of parliament. This is dangerous ground for Theresa May emboldened only by her party colleagues grand ineptitude and the frenzy of propaganda surrounding her Opposition leader. May has at least unlocked one achievement from her time in office: she has managed to make her relationship to the POTUS look even more craven than Tony Blair’s relationship to Dubya. These are dangerous times for both leaders clinging to power. But while they are locked in this common madness they are very different. Trump is frenzied, thin-skinned, incoherent. May is calm amongst her own debacle, uttering only her famously meaningless mantras carefully prepared by someone somewhere, whilst Trump just spools out a constant stream of verbal diarrhoea. Trump is the son of a Property Magnate from Queens, May is a clergyman’s daughter from Eastbourne. One is hiding behind the law one is hiding from it. One is a TV Personality acting in a Bad Box Set. The other is an Un-Personality propped up by the apparatus of office. Both are now more exposed than ever before. If Trump cracks under the pressure (after the Cohen raids pressure on the president has grown so intense that he is once again flirting with the idea of removing Mueller, or his boss, Rod Rosenstein), his presidency will end. Even the uselessness of the Republican leaderships won’t protect him. And, if May’s gambit fails to take public opinion with her it will just add to the mountain of evidence that she is unfit for office and the nest of enemies in her own party may surround her. So we have the most remarkable President hand in hand with the most unremarkable Prime Minister. A New York Mobster and a Home Counties Maid, extrovert and introvert disgracing their office in very different ways. Theresa May and Donald Trump decided to bomb Syria before the Organisation for the Prohibition of Chemical Weapons provided evidence from its fact-funding mission to #Syria. Both are an affront to democracy. In America at least we have someone chronicling the political and moral decline. Here our Sir Humphrey’s are much too discrete. On Friday the former FBI chief James Comey said: “I honestly never thought these words would come out of my mouth, but I don’t know whether the current president of the United States was with prostitutes peeing on each other in Moscow in 2013. Thank you, Mike. It expresses exactly how I feel. What scary times we’re living in. Who would have thought that the actions of the US president and the U.K. prime minister could make the Russian president look good and the most statesman-like leader on the world stage. I wonder if it’s just a coincidence that today there are over 100 anti-Brexit marches due to take place? May joins the growing list of war criminal prime ministers – all awaiting the judgement they deserve. It’s not just May of course. Anyone involved in any way in this war crime – including those who knew it was coming and did nothing to prevent it – are equally guilty. The hypocrisy is staggering. This is the PM who constantly invokes respect for “the rule-based international order”. By what twisted logic was the unprovoked attack on Syria – based on the lie of a supposed chemical attack for which there is no genuine evidence and carried out before the OSCW investigation could even begin – compliant with the “rule-based international order”? But of course I’m forgetting: it’s the New World Order rule of “might is right” and American (and British and French?) exceptionalism. Comey’s point is just as valid for all so-called ‘democracies’ these days, not just the USA. To be honest Richard I wouldn’t trust Comey either. Former director of the FBI lamenting the lack of truth and facts and identifying the presence of lies all over the shop is to me too depressing for words. These guys live and breathe lies for a living. The FBI/CIA….hardly reliable sources. Comey will have his motives no doubt. Guys like him always do. I’m not defending Trump here incidentally. I just think most of us figured Trump out without much assistance from the likes of Comey. They chased Hans Blix and his weapons inspectors out of Iraq when they found no WMD. They didn’t allow the investigators into the truth of whether chemical weapons had been used in Douma to finish their work. Watch out France, watch out UK for terrorism from yet another front. People are going to die just to rescue political careers on both sides of the Atlantic. I have no doubt that May told Trump that if he didn’t go this weekend,she would be forced to submit to parliamentary “scrutiny” which would take time with no guarantee as to the outcome. Could this attack be related to a regional power struggle – Iran versus Saudi Arabia and Israel? They came, they threatened, they blustered and then they backed down. Disregard what the BBC says. At the end of the day the US/UK alliance buckled and hit a few empty building. And talk show host President Trump has been shown to be the car salesman button that he is. New and smart he ain’t and the wider world knows it. Thankfully wiser council has prevailed. May and Trump have been exposed, the hapless trigger fingered owns that they are. A good analysis and a good read, Mike, but where does this leave Macron? So it looks like the poisoning of the spies was a UK/US concoction. This was the starting point for pointing the finger at Russia. I was amazed at how quickly France and the US backed the theory without evidence. Then we have the alleged chemical attacks in Syria. I say alleged because I don’t know what to believe anymore. Was it tear gas to create the illusion. Then May bombs Syria conveniently when parliament is in Easter recess. It all makes perfect sense. The US want to get rid of Assad. They need an excuse. May needs a trade deal and a distraction. Boom we poison some spies and say it was the Ruskies. I am now doubting if the spies were actually poisoned. Was the poison smeared in the area but the two spies just acting out. Where are they? I suspect you are absolutely right when you say everything from the Skirpal poisonings to the chemical attacks in Syria was concocted fake news. It shows exactly what an out of control country we actually have when we can go to war with absolutely to democratic mandate and on the basis of a tissue of lies. But thankfully the threat of retaliation from an equally tooled up Russia and its allies dissuaded the US/UK and France from bombing the living daylights out of Syria to effect regime change. The West has I think been shown to have backed down through the stabilising hand of Russia being a counterbalance to Western military aggression. And these are the people who control nuclear weapons and who would use them if they thought they could get away with it. No. Both the US and UK want rid of Assad. Both committed way back to training and arming all those rebels, remember. Sorry Jock, pressed send too soon. I agree with the rest of your post. It’s all very fishy! Salisbury happened at a time counter to Russian interests, it was amateurish and being questioned by many ex civil servants and Russian commentators. Do I believe Russia over the uk? No, I believe neither, but I have greater contempt for the uk as its politicians currently rule Scotland and are lying to Scots. uk government has not learned from the dodgy dossier, people rightly question and have access to other news channels not in hock to the uk state, e.g. bbc. Surprising how one policeman became ill, whereas no one from the public on the scene first, became ill? The appearance of investigators in protective mixing with colleagues in normal attire rung bells, it was like theatre. uk spokesperson said Russia had tested placing the poison on door handles a week after police said they were paying particular attention to the Skirpal’s front door. Oh, what a tangled web we weave when first we practise to deceive! And every MP including tories in the chamber today knows that, but the tories will lie, misinform and obfuscate to protect Mrs May. If one of May’s objectives was to get Brexit off the front pages of HM press,then she has succeeded. How to keep this particular potty boiling however is another matter. Perhaps,as a result of her actions,increased terrorist attacks will assist. Scotland leaves the UK which has become irrevocably corrupted by the narrow interests of obscenely wealthy liars. It sets up a new country, with a written constitution, where the seat of government is a short bus and train ride from anywhere in the country and we all know where our “maisters” live. If they misbehave (e.g. threatening the lives of my kids by starting illegal wars, based on lies) we can hold them to account. Does anyone else see the irony in a director of the FBI having the surname Comey? I find it hilarious. Whatever would Joe McCarthy have made of it? It’s called the Ministry of Defence, not the Ministry of Attack. Our shores were not threatened.